So, a couple days with my new ear glasses. Feeling lost already? Read this to catch up. Meetings at work are much better, even in the horrible room with the really loud ventilation. I can actually hear people now. It makes me wonder what I've missed. Normally I don't have music on my phone; I keep the room for photos and stuff. I've been playing music into my ears at work for a while, but being wireless is awesome! I've yanked the earbuds out several times as I turn to scribble something on my whiteboard. Now I can do that no problem. I can even go to the small kitchen to top up on water and 4 times out of 5 the music carries on. I can even carry on a conversation with the music going, because I tend to play it quite softly. Acoustic and classical sounds much better than through ear buds. Rock not so good. Yes, I'm hearing more stuff even in familiar music. Only two people have noticed, my office roomie and my buddy Lori I had lunch with the other day. If you know Lori D, send good thoughts to Regina on Sunday, she is doing the marathon. For tonight's run I wanted to get the phone slaved to the ear glasses, and experiment a bit. It didn't work at first, but then I tried again and the bluetooth hooked up and started playing music. Nice. Then Linda called me. Without touching the phone the music dimmed, I answered the call, and chatted. She had no trouble hearing me, and I had none hearing her. The acid test was taking it for a run. There was a bit of breakup when I had it in my back pocket, but it was about the same carrying it. Not sure why. The music dimmed obediently for the Runmeter announcements every K. Hearing them up till now was totally dependent on ambient noise. Almost anything would drown it out. Now it goes into my ears and life is good. They don't move at all. In order to make the bluetooth work there is a receiver to wear. It's the biggest thing of all, and is suggested to wear as a lanyard. I wear it under my shirt and it works fine. It didn't bounce around during the run at all. I wonder how it will deal with getting sweaty. I may have to find or make a little bag for it. I'm still getting the volume controls sorted out, and getting used to having them in my ear canals. I'm glad I've warmed up with the ear buds. A couple times I've had to take them out, and scratch and tug at my ear. It tickles a little bit sometimes. The most annoying thing so far is the muted sleigh bells I hear if something brushes against the top of the ear part. I'm not sure if that's normal, or if there is an adjustment that can take that out. Here's what one of them looks like. Wed I swam in the morning, then water ran with Katie. I got a bit further swimming, but the water feel was very erratic. A couple laps felt good, but the last couple were slow and floppy. It will take a while to come around. 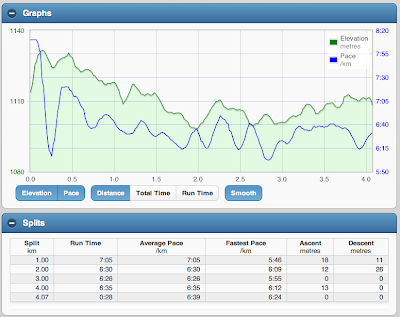 The run started clunky, very clunky, and gradually improved. Toward the end it was feeling pretty good. The main idea was to just get out and do it. 4K, 27 minutes. Hot and humid for Calgary, so I'm a sweaty unit once I got home. Even the cats are hot. Here is Curtis being very languid. Wow, your ear glasses sound amazing, Keith! Technology has advanced so much - I taught a partially deaf boy in the north and he had two hearing aids...the things were always popping out, they were huge and cumbersome and the receiver was like the old walk-mans! And the squeal that happened every now and then - horrible! Love the picture of Curtis :) And my nephew is running his first marathon in Regina this weekend - so excited for him!! They do sound amazing, Keith. My husband's buddy got some ear glasses lately and he loves his as well. Just wish they didn't cost so much. My dad could really use 'em. Love the idea of being able to answer the phone and listen to music through them. Very very cool.